I love walking through old cemeteries but not at night or on Halloween eve. Being an avid genealogist, I have searched through many graveyards looking for a family name carefully chiseled on a headstone. This past summer found my husband and I returning from a vacation trip to Northern Idaho. We normally travel on the I-15 freeway but we detoured to an obscure country road because I had an ancestor who died in Idaho near the Utah border. Driving through the town of Oxford didn’t take much time as it is small but still populated by farmers, former residents who have returned to spend their last years in peace and quiet, and a few hardy commuters who live there and travel to nearby towns to work. There are no sidewalks just irrigation ditches, old abandoned farmhouses and barns. One prominent building, the LDS church meeting house, still stands in the center of town. We were able to walk inside and imagine what it was like when the locals attended activities and worshipped here. My 2nd great grandmother, Ada Winchell Clements, had come from Springville, Utah to visit her married daughter in Oxford, and died here. I had never seen her headstone. No burial grounds were in sight. They are usually hidden on hillsides outside of town surrounded by large trees or bushes. By asking a local resident, we were able to find one on the road south of town. With no sexton to direct us, we started searching in the oldest part of the cemetery. Walking up and down each row of headstones, looking for a familiar name took awhile. My husband searched a different section. He soon located an old headstone with my family’s surname. Close by a four sided monument had names and dates carefully chiseled and a little verse of remembrance on each side. My 2nd great grandmother’s name was barely visible, erased by constant weathering year after year. Doing a pencil rubbing on a piece of paper placed on the face of her headstone allowed us to discern her name and dates. I already knew quite a bit about her life and sacrifices to come to Utah from New York, suffering through all the Mormon persecutions in Ohio, Missouri and Nauvoo. Somehow now, standing next to her found headstone in that lonely old cemetery so far from my home, I felt a renewed sense of family. Wow, that's so interesting! And wonderful that you found your 2nd Grandmother's headstone and grave. I love to visit cemeteries, even when I don't have any relatives buried there. 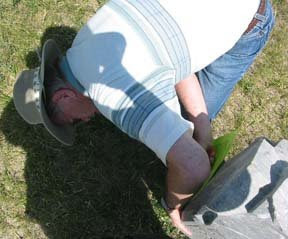 BTW, are you familiar with Findagrave.com? 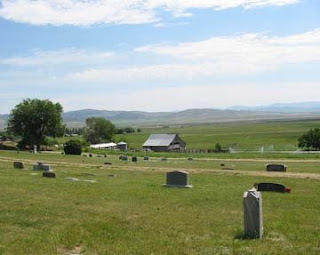 I've found photos of some of my ancestors' headstones/graves on that site. For some odd reason I'm all of a sudden really, really wanting to visit Oxford, Idaho. You just made it sound like the type of place I love. And the photo is mighty inticing as well. I also like to stroll through old cemetaries. They fascinate me. There are so many stories lurking behind the tombstones. You and Allen really do some interesting things when you "trip". I can't wait for Oregon next summer! This is interesting, Lin, although I can't truthfully say I 'love' visiting cemeteries. However, when I have to "force" myself to go to a funeral, I do wander around through the headstones - reading and searching to see if it is anyone I knew (or if I know any of their relatives). That is really interesting. I've loved visiting really old cemeteries in Boston and Savannah. Fascinating, the old, old headstones! This is all so interesting. It's a wonderful thing to visit your ancestors and bring their spirits back again.